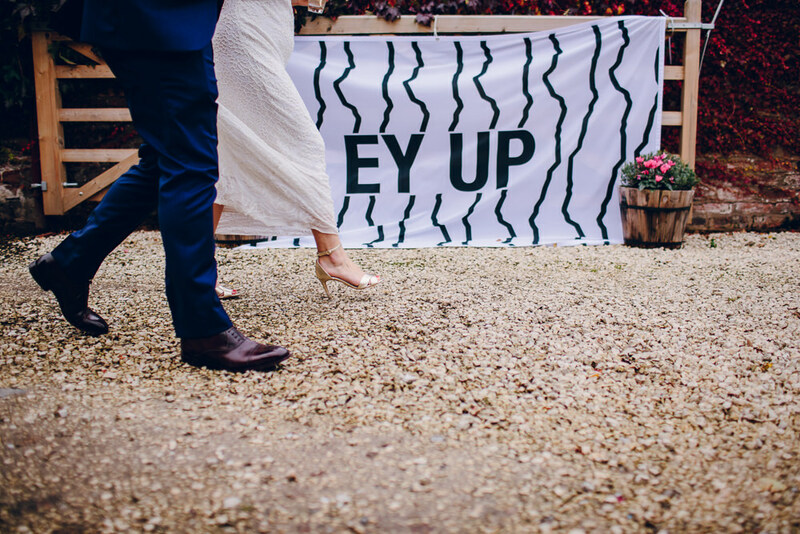 WWW readers Kendra and Rob had a good old northern knees up to celebrate their wedding and what a brilliant day it looks to have been! 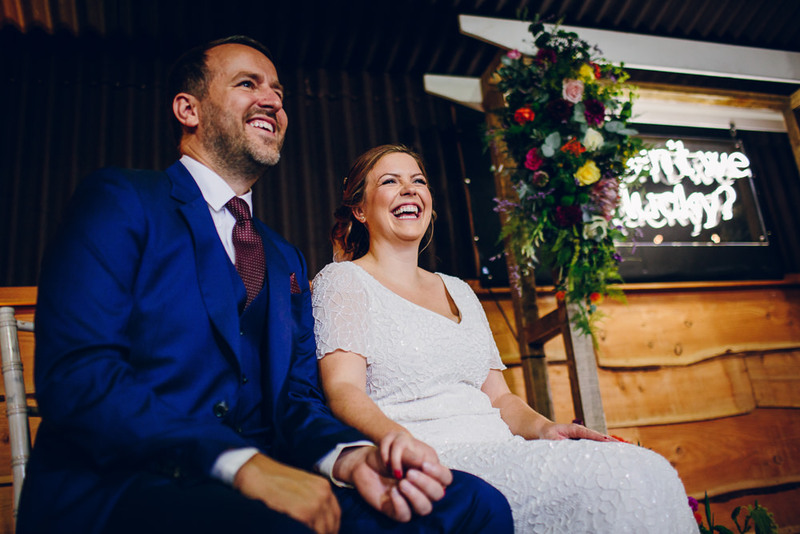 They had their legal ceremony a few months before the big day, which allowed them to do exactly what they wanted with their I dos at Stock Farm in Altrincham on the 13th October 2018. I’m absolutely loving their northern knees up vision! 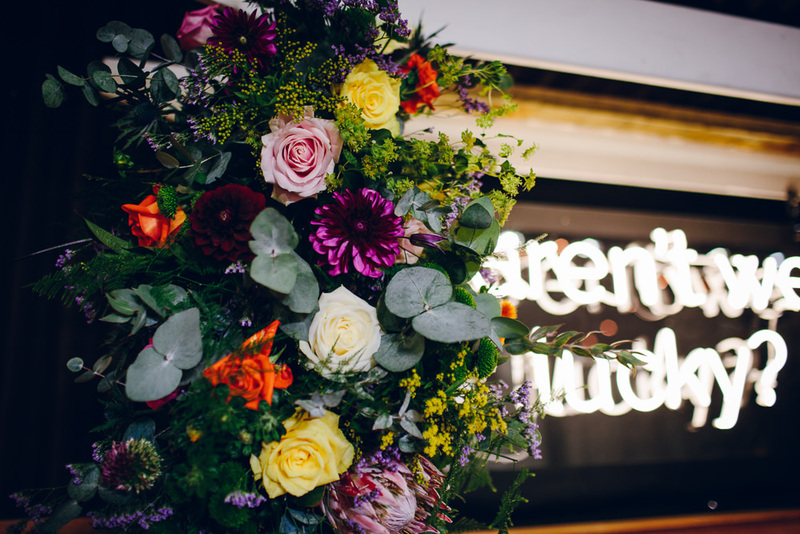 From the drape signage to the menus, the food and the general party atmosphere, not to mention the informal ceremony and the colourful décor, it looks like the laughter and revelry didn’t stop all day. 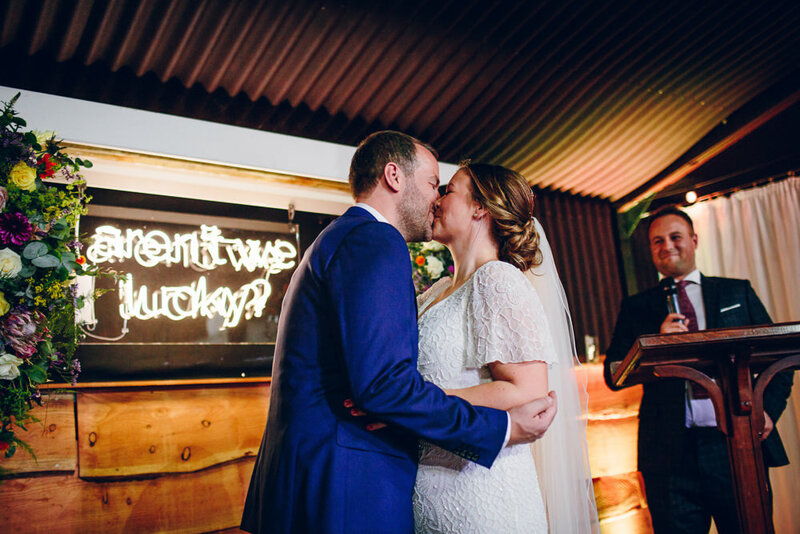 There are so many cool personal touches to take in, with one of my favourites being the bespoke neon sign of a well used family saying they had created. I also love that it’s proudly displayed at home now, how special is that? 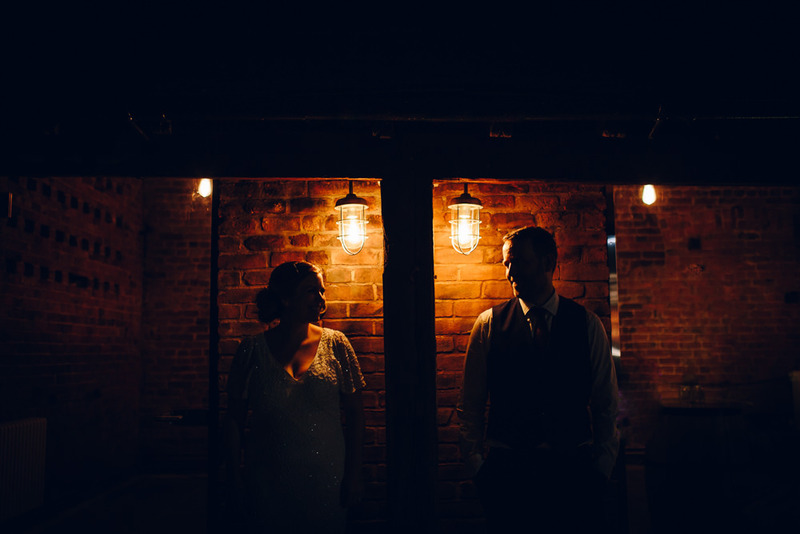 Amy B Photography captured some truly excellent couple portraits as well as documenting the festivities in progress! Thank you so much for sharing Amy. A random Thursday in December 2017, in our back garden! 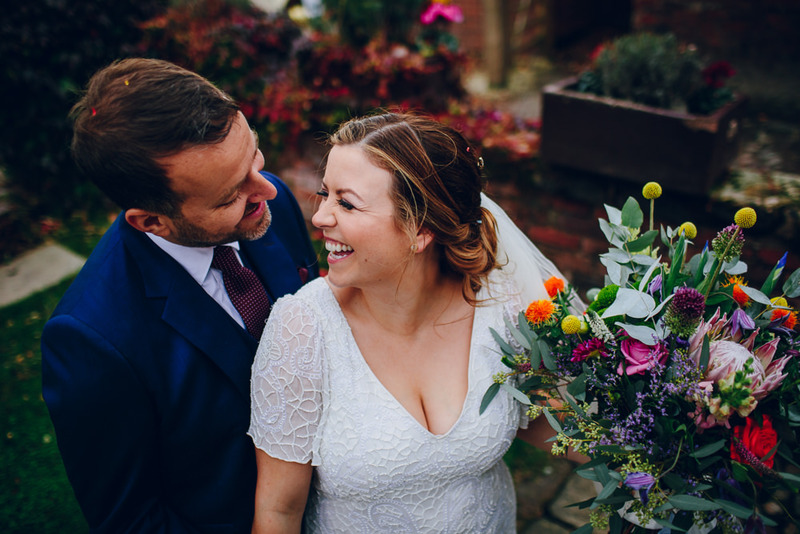 We had our garden renovated in the summer and Rob thought that it would provide the perfect backdrop for a surprise proposal. He’d checked the weather, installed extra lights, lit the fire, warmed the mulled wine and got the blankets out…and then it started raining. I arrived home after work with our daughter Iris, walked through to the back garden and was in complete shock as he grabbed Iris, got down one one knee in the pouring rain and asked if I’d like to have the same surname as them. It was soggy, rushed, and completely perfect. Rob designed my ring with Kiran from AKA Bespoke Jewellers in Manchester who were recommended by a friend; I absolutely love it. We both had our wedding rings designed and made there. We knew that our main focuses were gathering all the people we loved in one place, and having a big party. 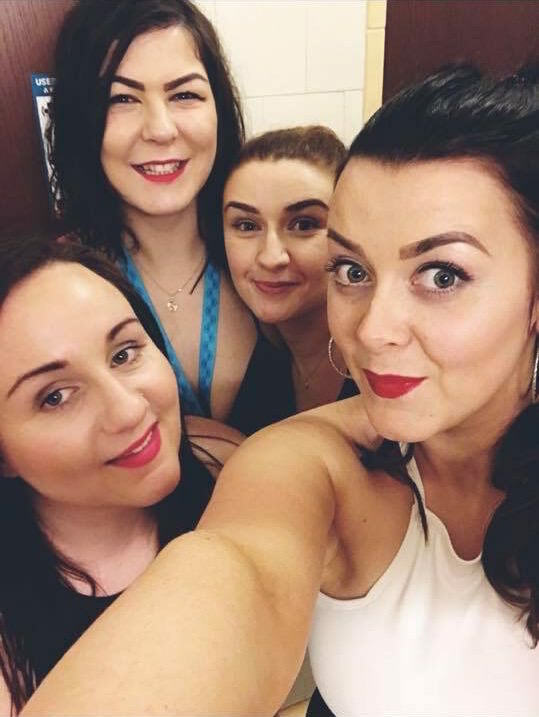 We came up with the idea for a ‘Northern Knees Up’ quite quickly; we’re both from big northern families who get on like a house on fire and we wanted to capture that in our day. Less of the formality, more of the fun. We reflected this in the language we used in stationery, the running order of the day, the band we chose, décor and the food. 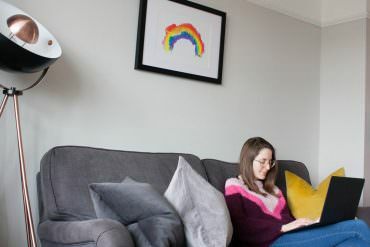 Having said that, our vision did develop over time – we’re big fans of colour and wanted to incorporate that into the décor; which isn’t strictly related to anything ‘Northern’ but we decided we were happy for things to mash together that felt reflective of us rather than being too restrictive with a ‘theme’. As part of our vision, we also knew that the idea of a formal ceremony didn’t appeal to us; so we decided to legally get married a few months before the wedding. We went to our local registry office, there were 12 of us including my 91 year old nan who was guest of honour, and we had afternoon tea at our house and an evening in the local pub to celebrate. 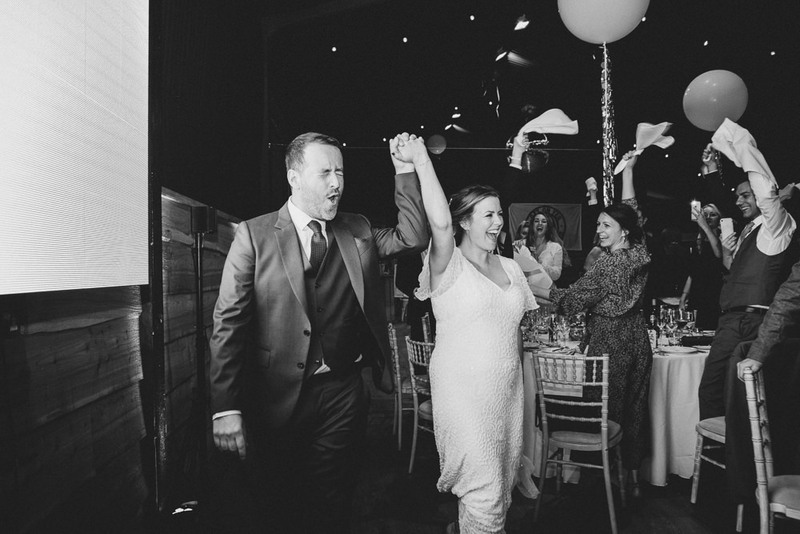 I would really recommend this to other couples – as well as getting to wear another dress (!) 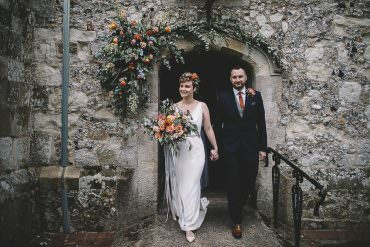 it felt very intimate and special, allowed us to be more flexible on the wedding day itself and removed any nerves there might have been; we travelled to the ceremony together! 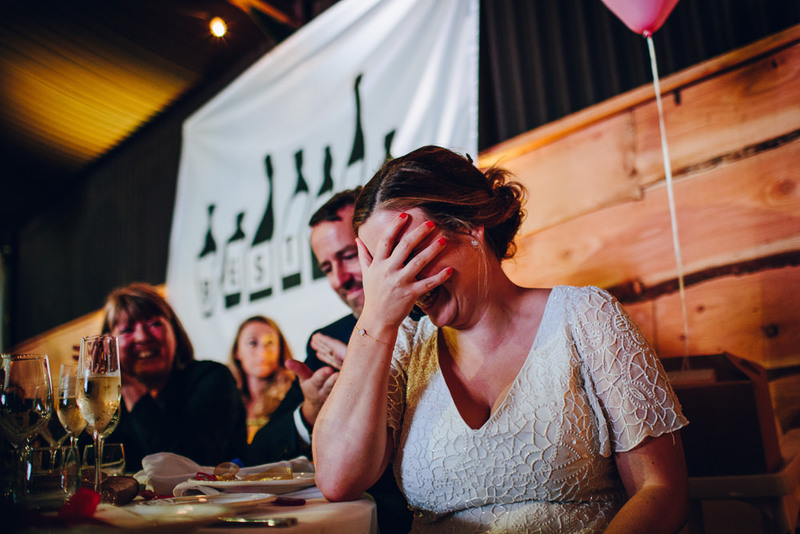 A running joke in our relationship is that we don’t mess around – we moved in together within 6 months, had a baby a year later and the wedding was no different. We knew we weren’t the kind of couple to plan the wedding for three years so we decided that less than a year’s lead time would be ideal. 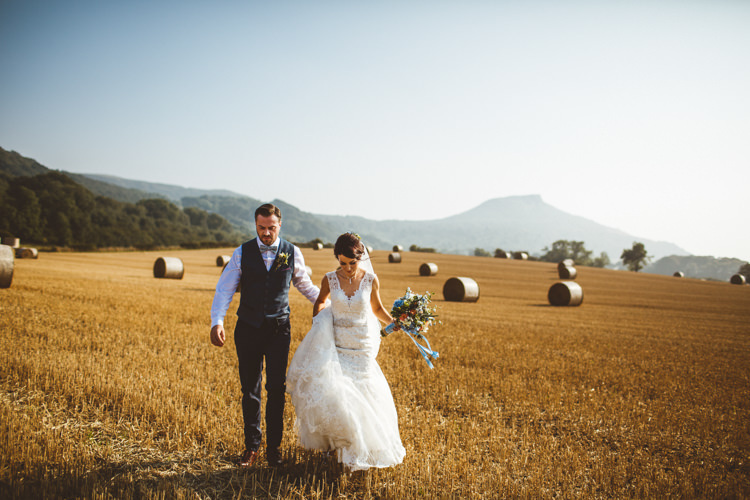 We were lucky that as we got married outside of wedding season, our first choice suppliers were all available on the date we chose, as was the venue. I did say a few times during the planning that I could understand why people did plan for three years!! It was fairly intense and we had to make decisions quickly, but generally we are quite decisive so it worked well. I also wanted to be creative with the process, designing my own stationery, thinking outside the box with styling etc. which did add on extra planning time but I really enjoyed the whole process. 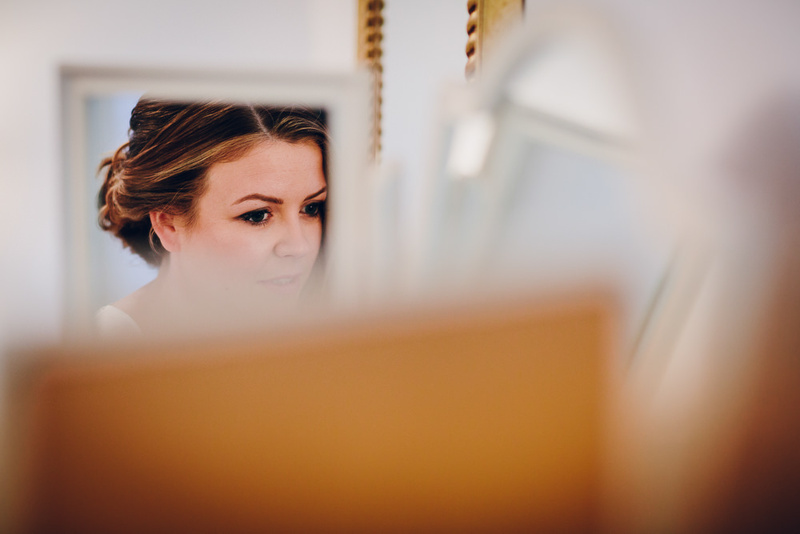 In the month before the wedding, I was doing something wedding related every evening, and so by the time the wedding day arrived I was fully ready for it to be here! 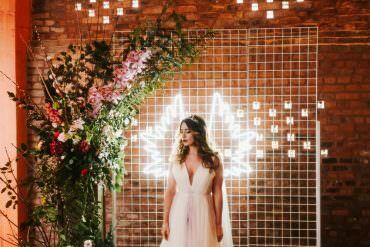 I enlisted help with planning from an ex colleague Zara Hill who was a dream in understanding the vision, being on the day help and styling the venue for us. I would completely recommend enlisting a wedding planner. 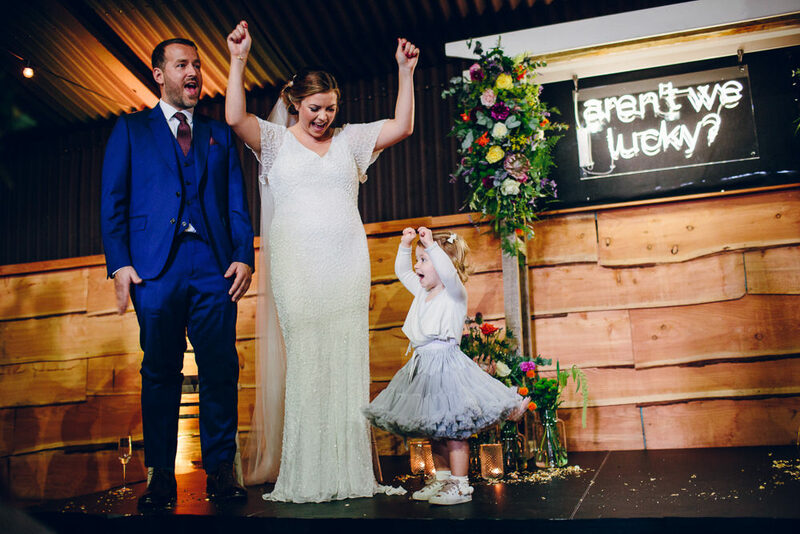 We did have a slight surprise during the planning process – a few months before the wedding we found out I was pregnant with baby number two! Despite initial worries about my partying ability / fitting into the dress this turned out to be a nice addition to the day, and something else to celebrate. 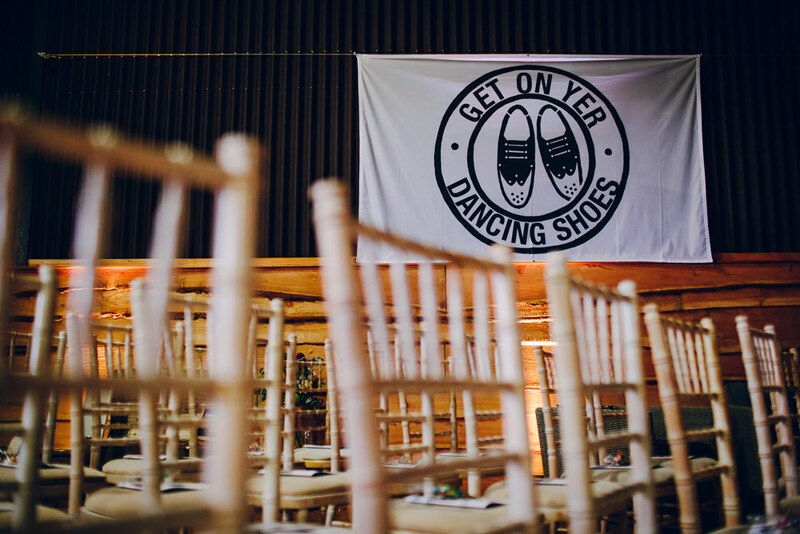 When I started the venue search I really struggled initially to find anything that appealed to us. We had 150 guests so needed something to accommodate a large group; we wanted a flexible venue which wasn’t too formal or ‘done’ but that had good facilities and the opportunity to make it our own, we ideally wanted somewhere we could stay on site to make it feel like a weekend, and were willing to travel but had a lot of people flying in so it needed to be near an airport. After about two weeks of heavy Google searching, we came across Stock Farm which is a relatively new venue, only 10 minutes from our house. We arranged a visit the next week and we immediately knew it was ‘the one’. 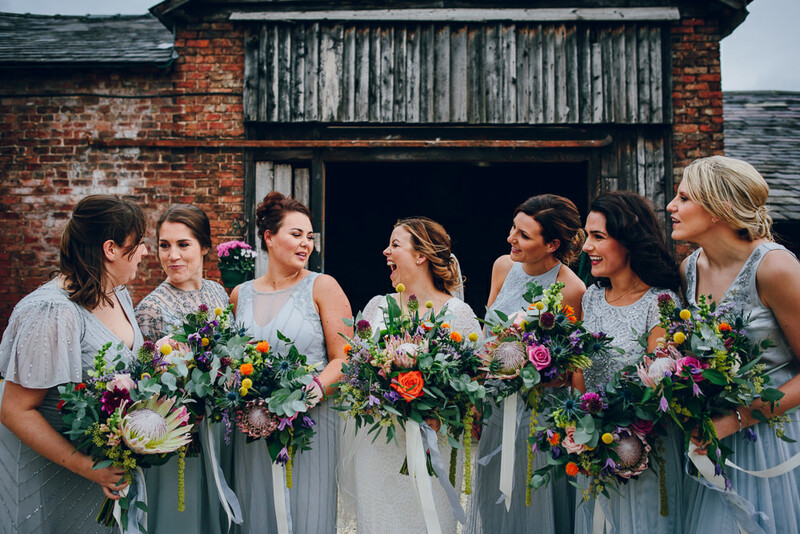 It’s a large barn which is very tastefully done but that was a blank canvas to put our own stamp on it, had on site accommodation in the form of a farmhouse which slept 10, and the team were very open to being flexible with how we structured the day. 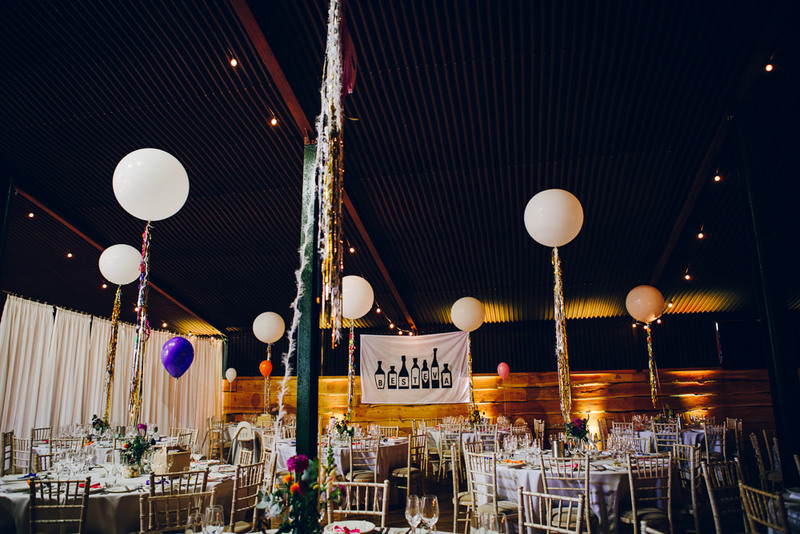 Because it was a new venue they also had availability in 2018, so we booked it there and then! 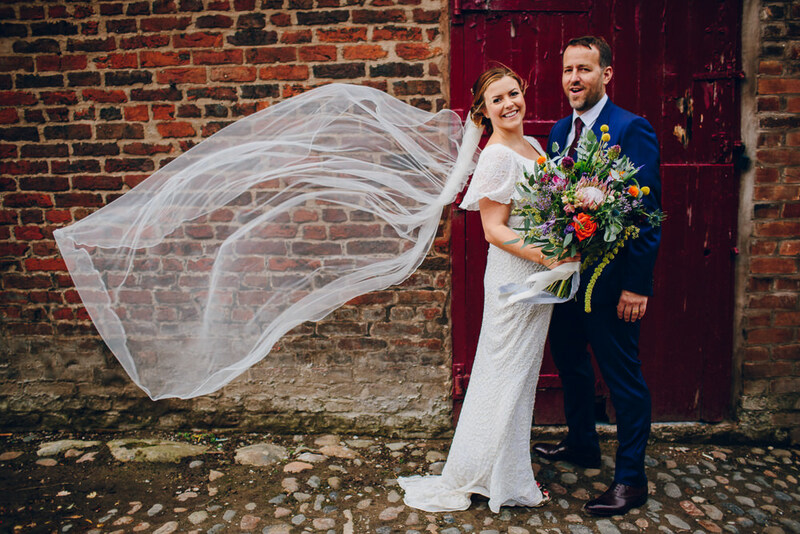 The day before the wedding, Storm Callum hit the UK and the weather was literally wild. 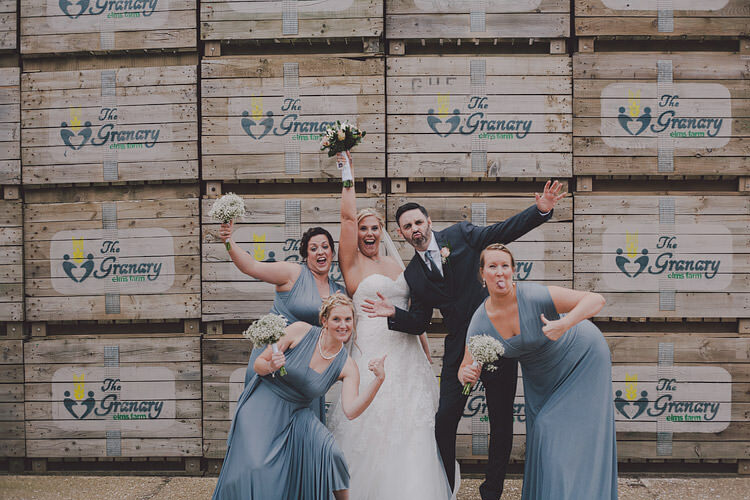 With an autumn wedding we were prepared for a cooler temperature but Stock Farm has great outdoor space and we were hoping to use it – miraculously the rain stopped the morning of the wedding and we were able to have the drinks reception outside. There were still strong winds, but they made for great photos! 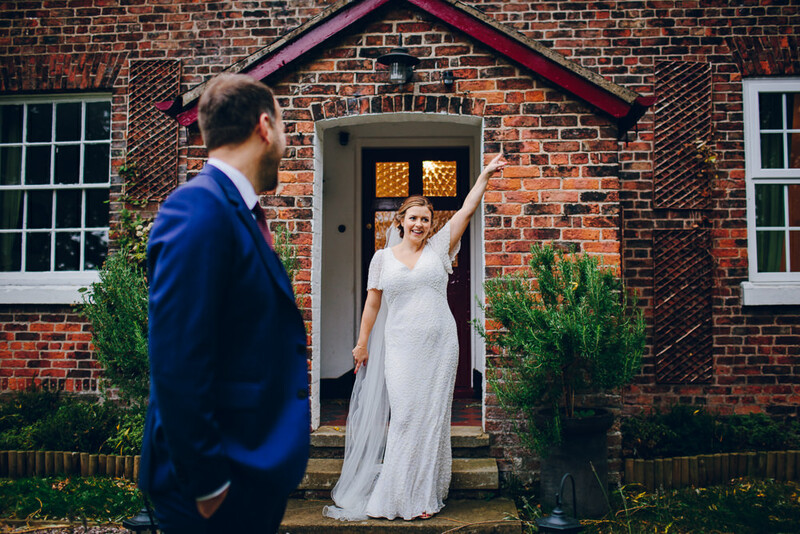 Bride – I have always liked beaded dresses so when I found Eliza Jane Howell online I knew I wanted to try some of her designs. 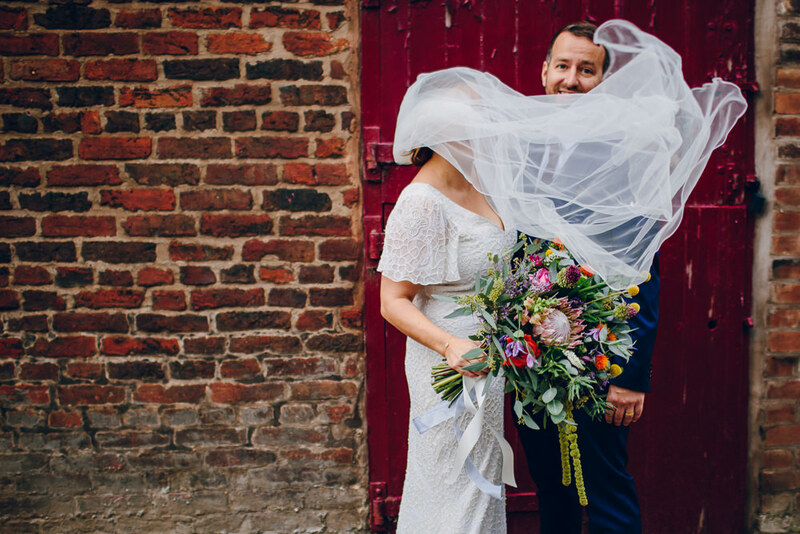 The Bridal Emporium in Leeds (where Rob’s from) was a stockist, and my mum and I had a lovely laid-back experience with the friendly team which is exactly what I wanted. The ‘Clarissa’ was the second dress I tried on, and we knew it was the one for me. I bought it there and then (running theme!). 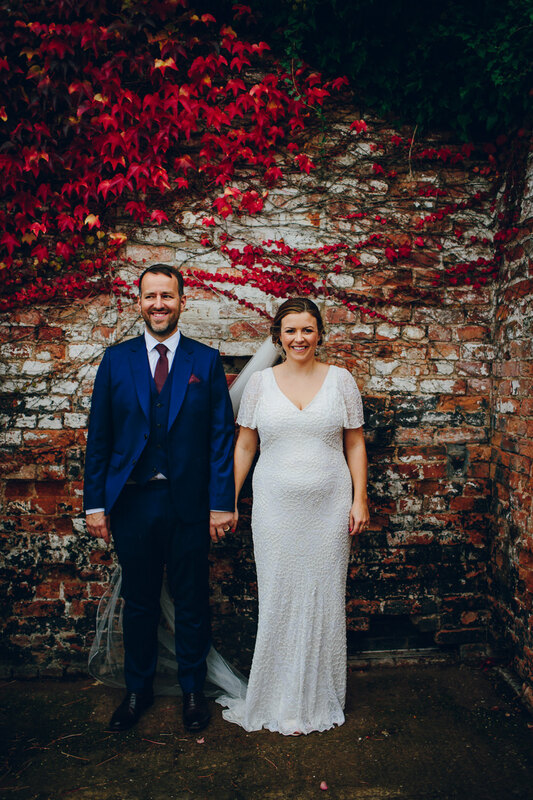 I was panicking slightly when I found out I was pregnant about whether it would still fit, but the girls put me completely at ease and it was a perfect dress to show off a little bump on the day. 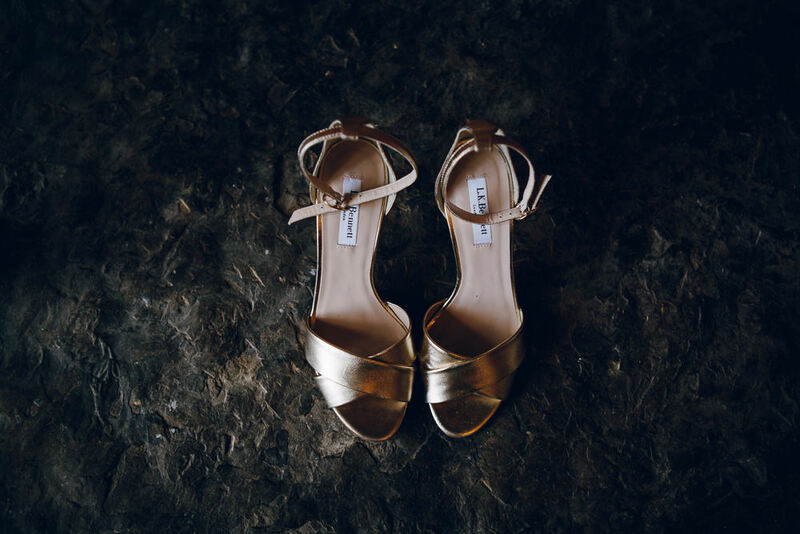 I found my LK Bennett shoes on Brand Alley for a fraction of the price, used a Chloe metallic bag I already had, and Monica Vinader jewellery was gifted from my lovely bridesmaids. 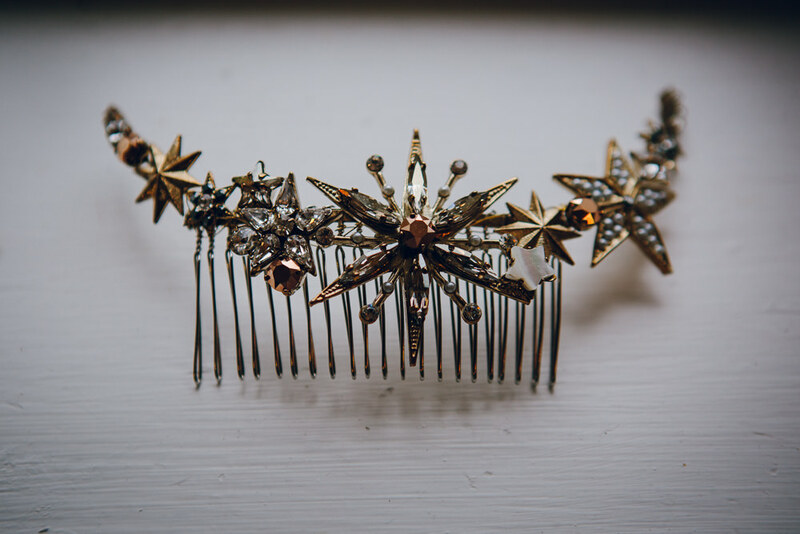 My bridal splurge was on a beautiful Tilly Thomas Lux head piece – I wore this to both the legal ceremony and wedding after my Chief Bridesmaid suggested it would be a nice tie in, and she was right! It really made me feel special. 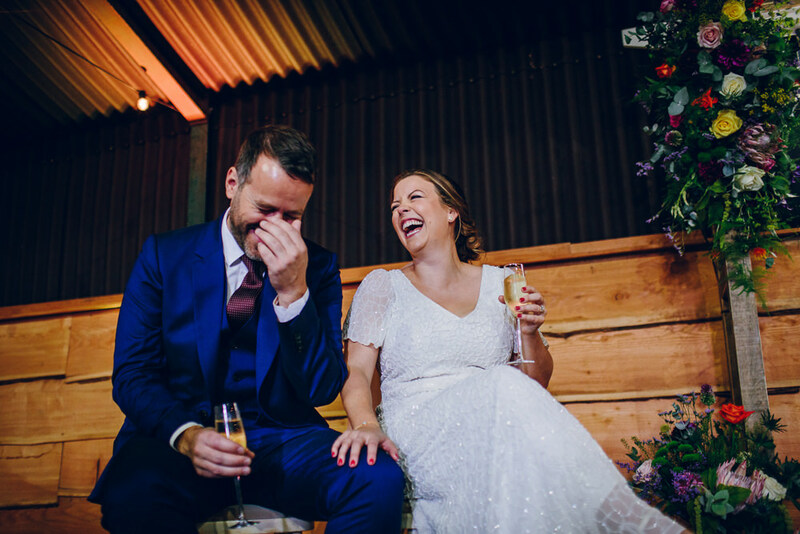 Groom – Rob’s suit & shoes were from Paul Smith; originally I wanted him to wear grey to match the bridesmaids but he sent me a photo of himself in a royal blue suit and it suited him so much that the co-ordination went out of the window! 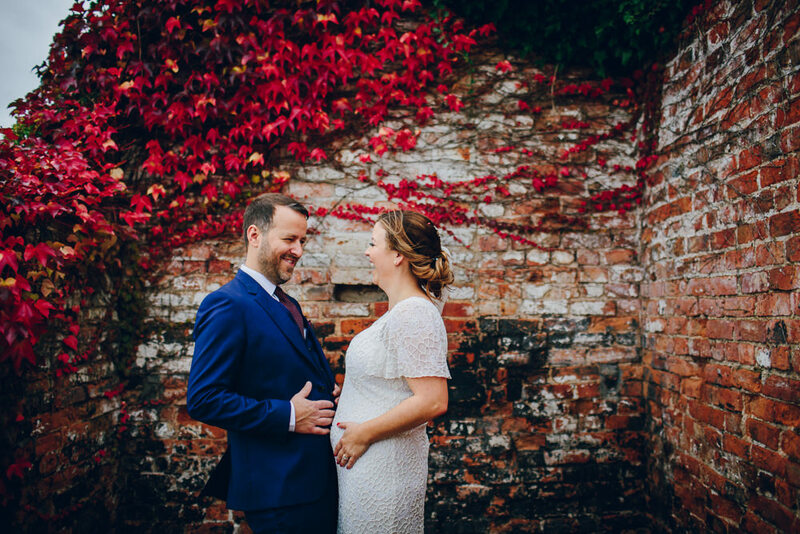 It looked great on the photos against the autumnal hues of the venue. 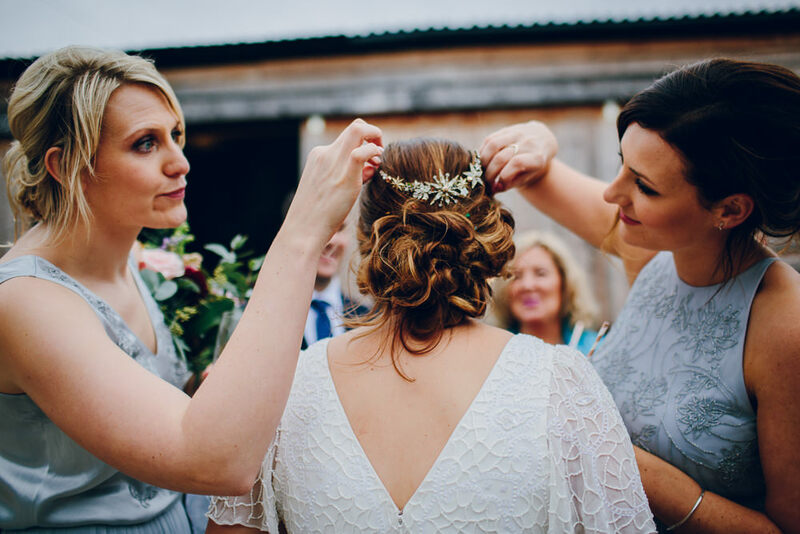 I was lucky that I had friends who specialise in bridal hair and make-up; Sophie (SECO) has done my make-up on several occasions before and did an amazing job creating the look I wanted – natural glamour which would last all day. Lisa (AMOR) is another old friend and did our hair; the bridesmaids all had something slightly different. 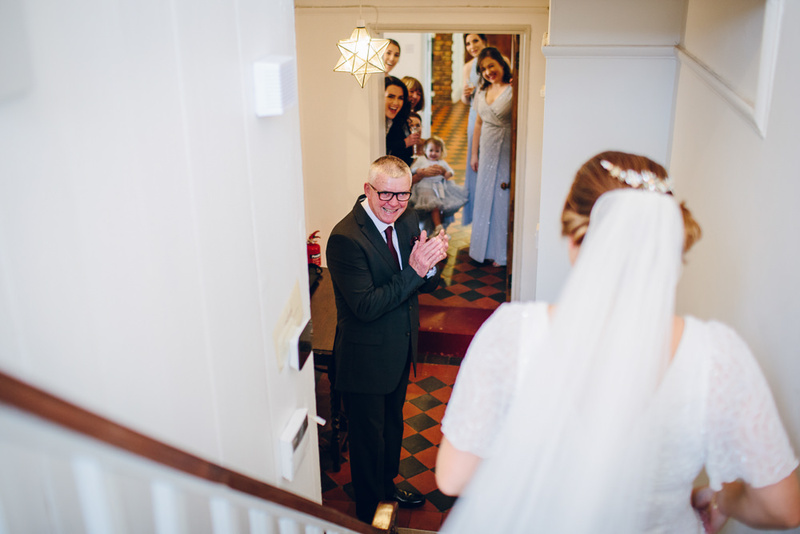 Both of the girls brought smiley faces, and a relaxed, no stress feel to the morning of the wedding which created a lovely atmosphere while we were getting ready. The best men and our dads are geographically spread from London to Leeds to Mexico! So they wore grey suits they chose themselves, which were from a variety of places including Slaters Menswear and M&S. 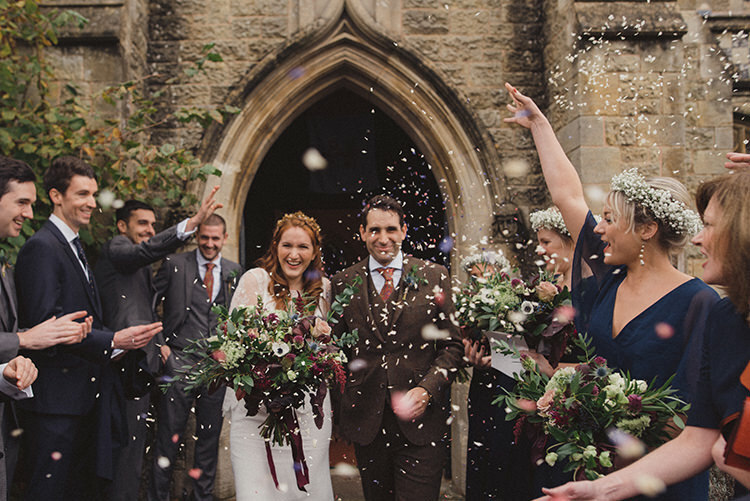 We chose maroon ties and pocket squares from Reiss (which doubled up as their wedding presents.) Max who is Rob’s nephew was an usher and the coolest dude at the wedding in a maroon velvet jacket from John Lewis. 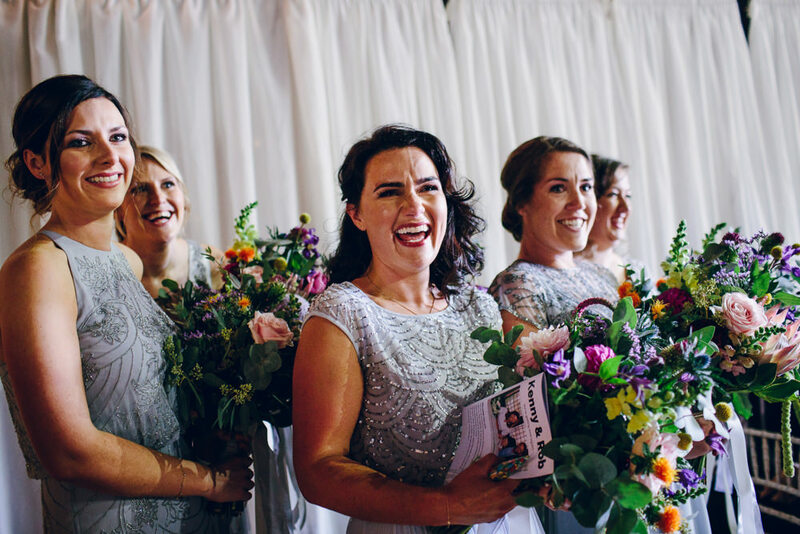 I had six bridesmaids who are my closest friends; we did have a few logistical challenges in that they were also geographically spread from Australia to Spain to the UK! They are all a variety of different shapes and sizes and I really wanted them all to wear something they felt comfortable in. 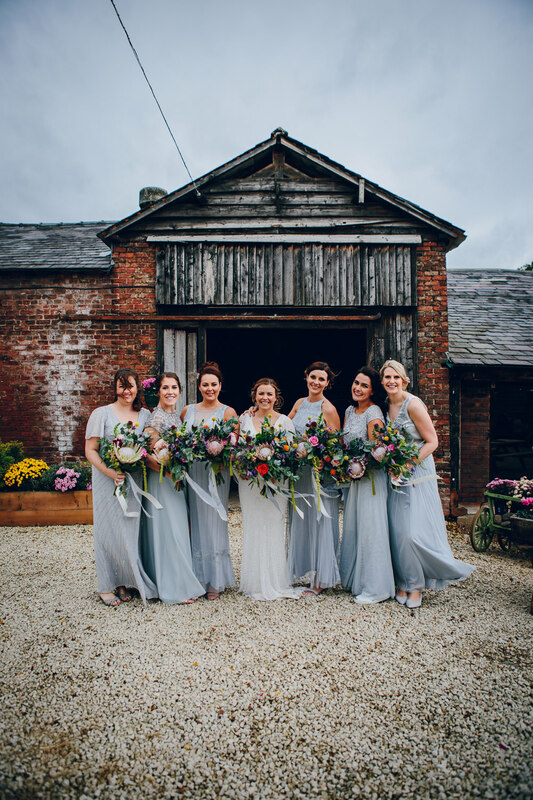 I had always liked grey dresses and was happy for them all to have a different style so the online search began; I was lucky as they are all very low maintenance! 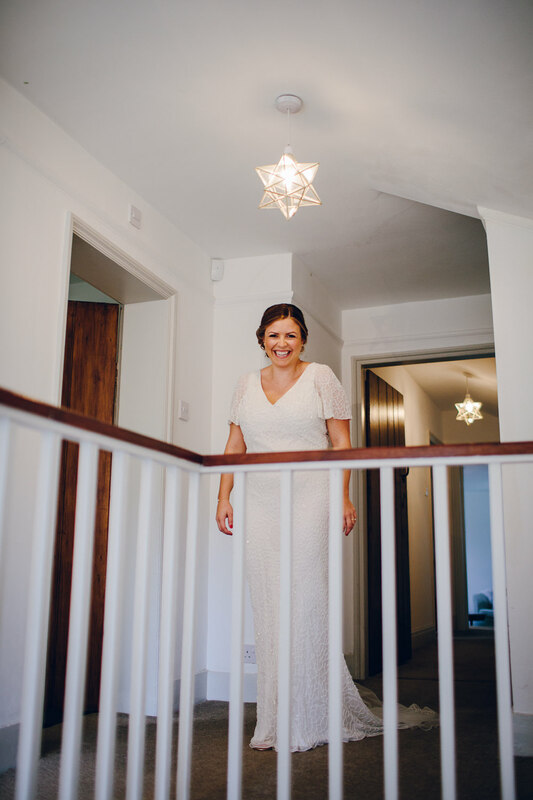 We got most of the dresses from a range at Monsoon and then supplemented with one from ASOS – I loved the shade and they had some beading/sequins like my dress. 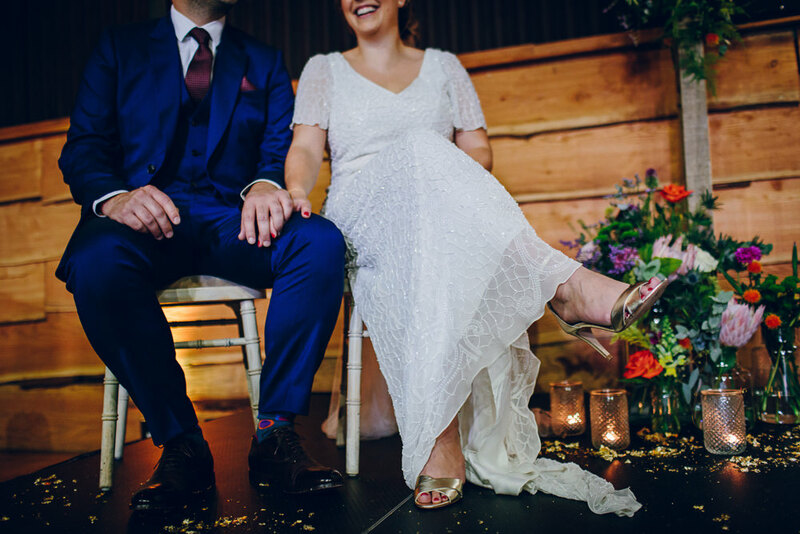 They wore their own shoes and I bought them earrings and hair slides as their wedding presents from Anthropologie. 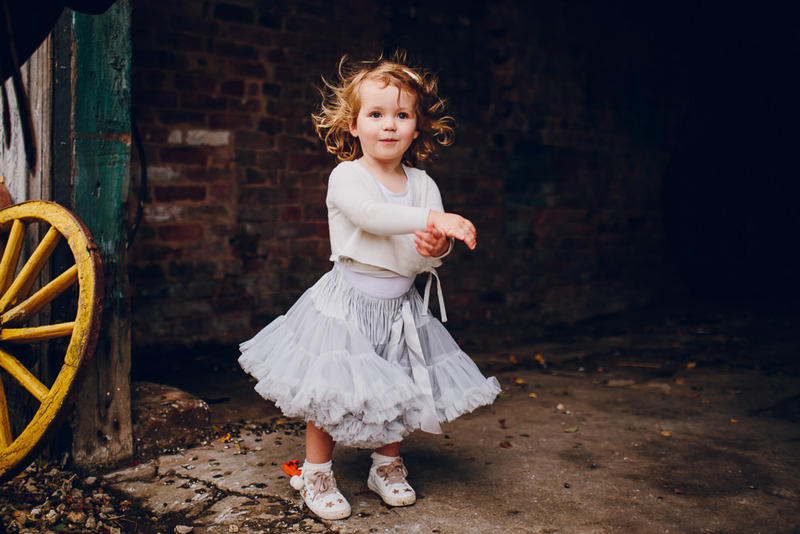 Iris was a flower girl and wore a Bob & Blossom grey tutu & white cardigan from M&S with trainers from Zara. We also had four ushers, Rob’s niece and nephew, and my cousin’s daughters. 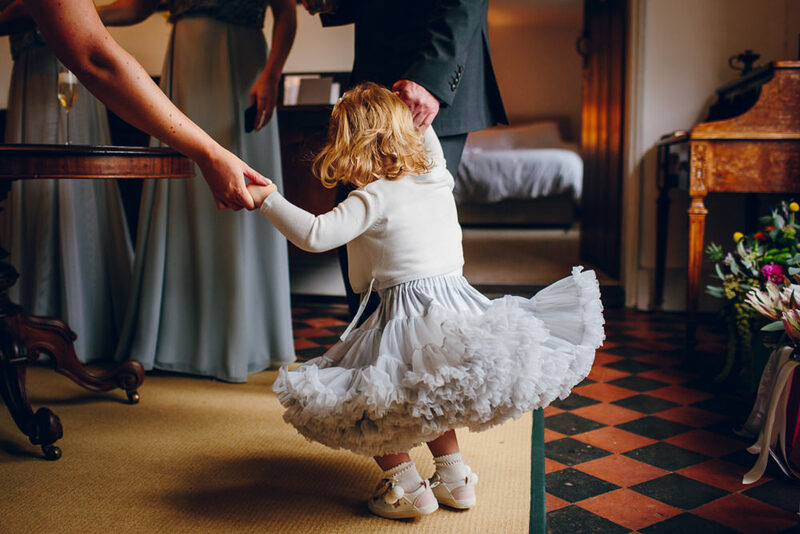 The girls wore tutu skirts from M&S in a blush colour which complemented the bridesmaids, the same cardigan as Iris from M&S and trainers from Zara / ballet shoes from Debenhams. 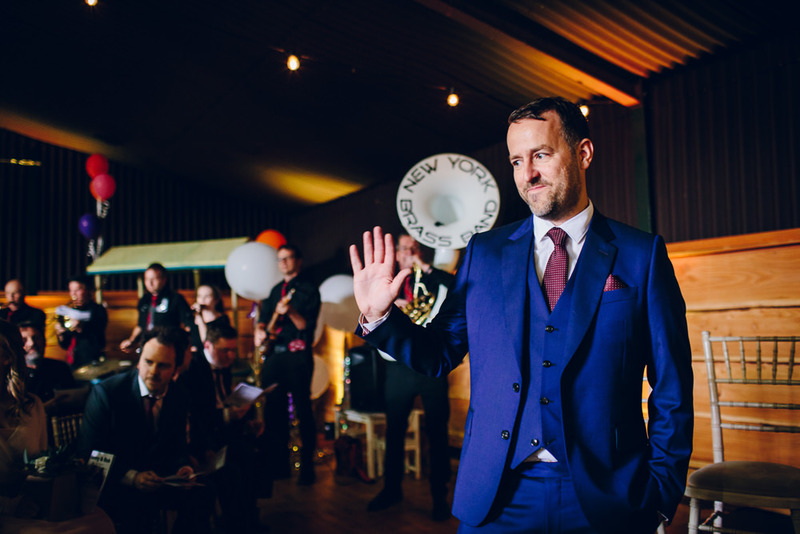 As the legal ceremony was already complete, we could do what we wanted on the wedding day; we still wanted people to feel like they were at a wedding and not just a party, so we asked our friend Adam to conduct a ceremony on the day. 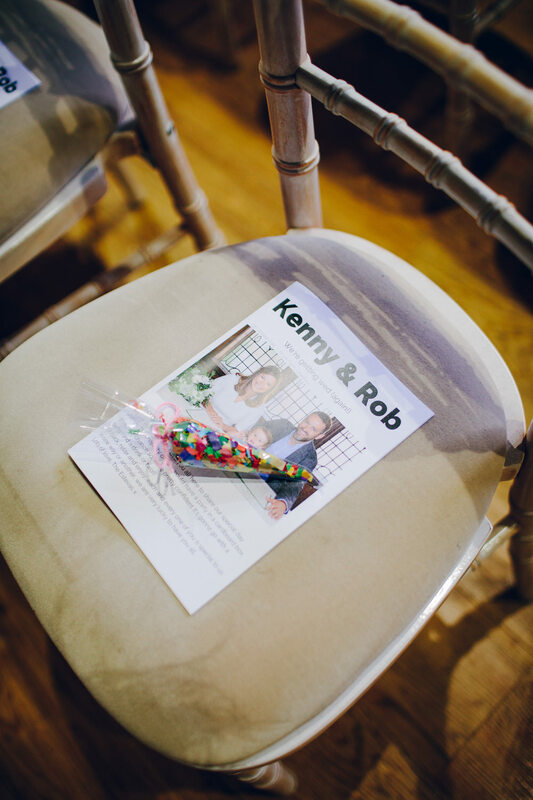 I wrote the ceremony myself which was ‘The Story of Kenny and Rob’ and detailed how we met (at a cricket match), how we got together (via a second date in Hawaii) and was truly our favourite part of the day. 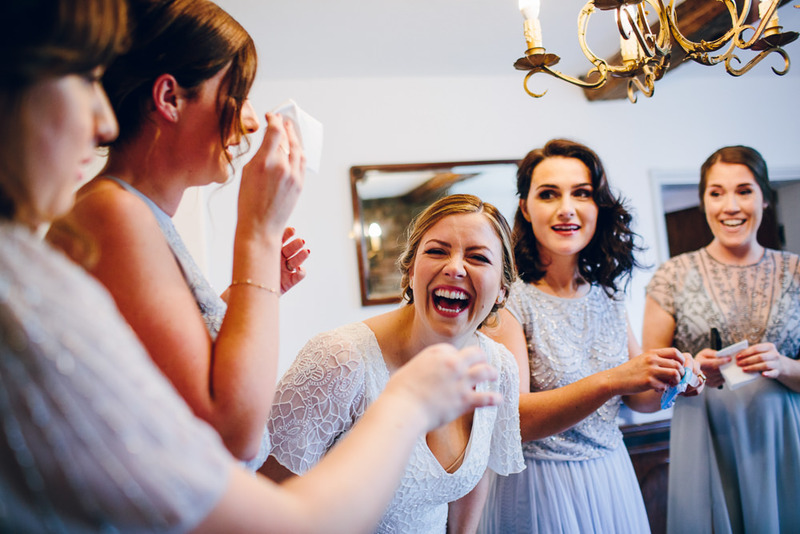 Everyone had drinks as soon as they arrived, which once they were seated, were topped up throughout the ceremony, we purposely chose upbeat, celebration music to set a happy tone and everyone was laughing and smiling the whole way through. It was just what we wanted. Readings – again I wrote these as I struggled to find anything which was truly ‘us’, I wrote a poem ‘Love Is’ for the legal ceremony which Rob’s cousin read, and my cousin read ‘Excerpts from Facebook flirting’ – our initial conversations after meeting were all done via Facebook Messenger and I compiled a collection of them for her to read out, which went down a storm especially as some of them were cringy attempts at flirting from Rob! We decided to have our band in the afternoon and chose New York Brass Band as a northern reference and to get the party started. 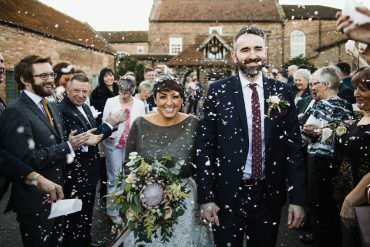 They played the music during the ceremony and I walked down the aisle to ‘Higher and Higher’ which was an amazingly uplifting start to the afternoon – so much so that I got a cheer from our guests as I walked down the aisle! 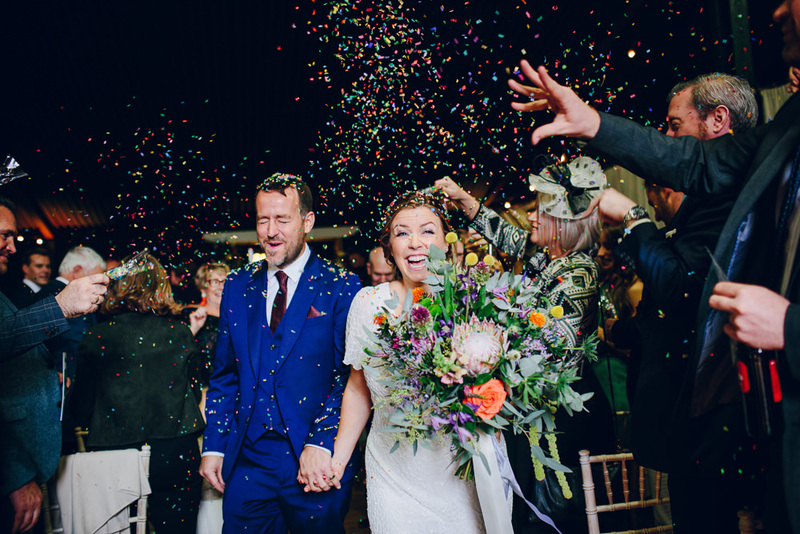 We also had the band play ‘If you’re happy and you know it’ during the ceremony which is one of Iris’ favourites, everyone got up and sang / did the actions – Iris joined us on the stage and led from the front! In the evening we had a DJ – one of Rob’s best men is a radio DJ, and his on air partner did the DJing for us. 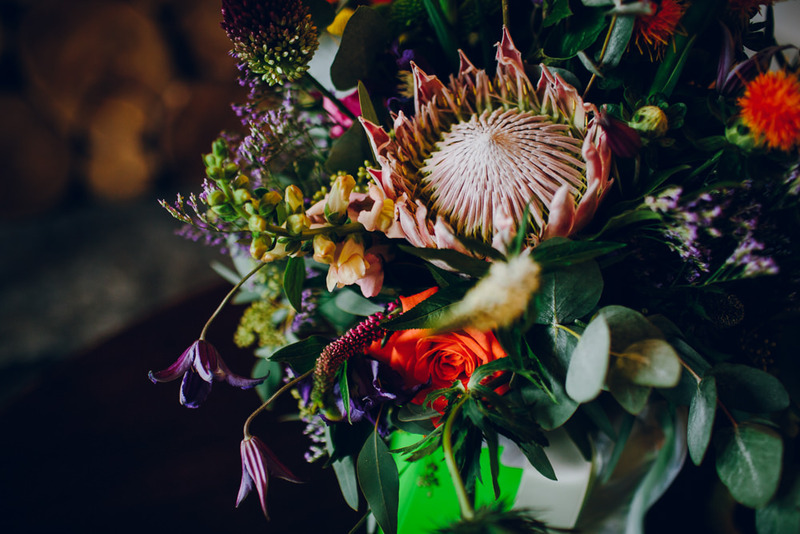 We enlisted Mel at Flowerbomb in Littleborough as she is a family friend and she didn’t disappoint with our wonderfully bright, wild flowers. 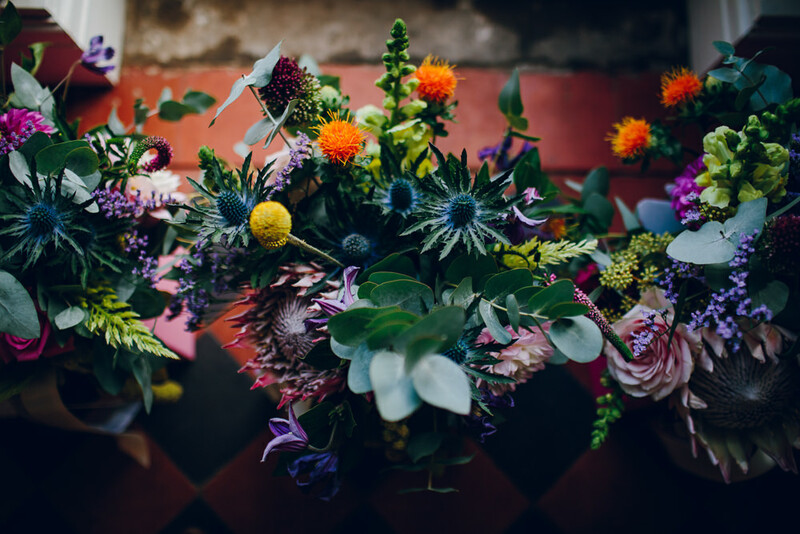 Ever since I saw Phoebe’s winter wedding in Friends I’ve loved the idea of a bright bouquet – and so did some research with the help of my Uncle who’s a flower arranger into what flowers I wanted to include so we could give Mel a good brief. 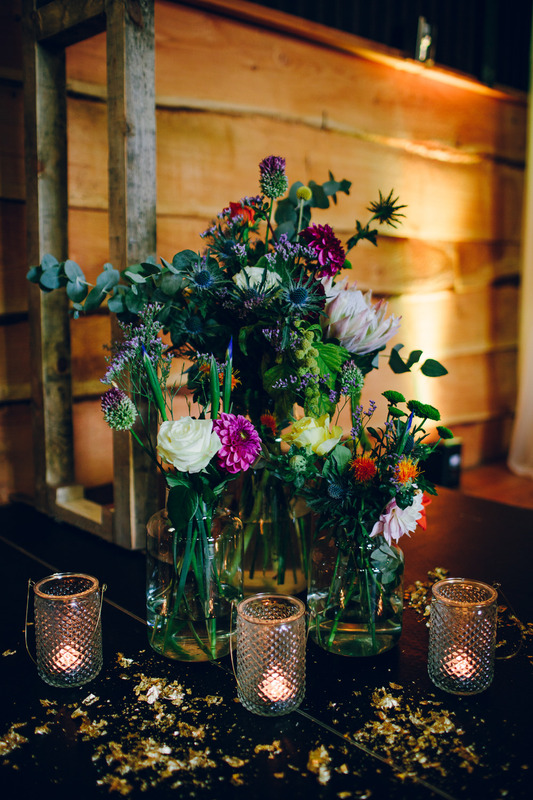 Initially he was concerned about my off the wall insistence on combining native, tropical and English flowers, but he agreed the end result worked so well! 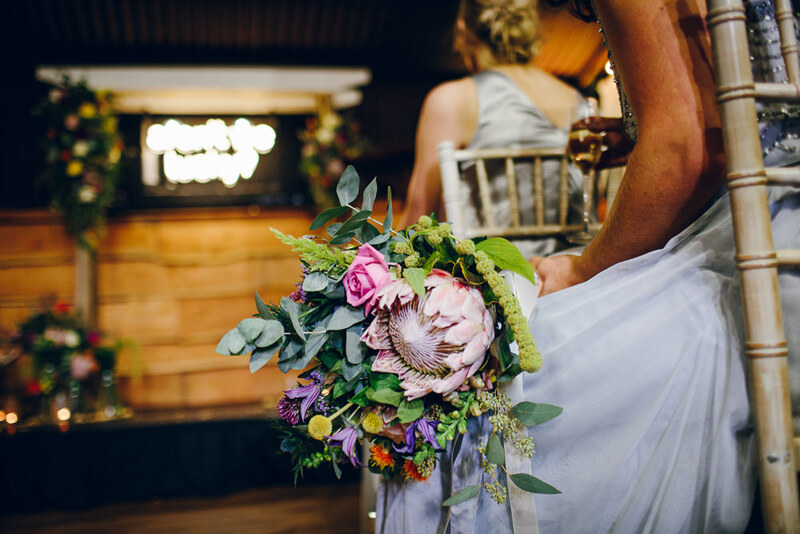 We had hand tied bouquets for the bride, bridesmaid and ushers, large displays for the altar and smaller jam jars to go on the tables. The morning after, we distributed all the flowers to family and friends so they could take them home and enjoy them which was half an hour well spent as it meant they didn’t go to waste. We didn’t have a wedding cake. 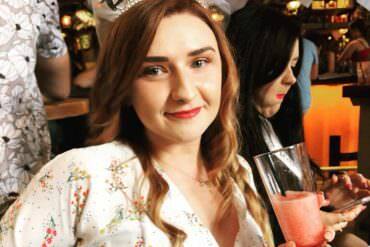 We found Amy online – we loved her style which was capturing people and moments rather than posed shots. When we had a skype call the conversation flowed as we had a lot in common, our kids are the same age and she’d recently relocated back up North so it was easy from the start. We felt like she really got ‘us’ and what we wanted from our photographer. 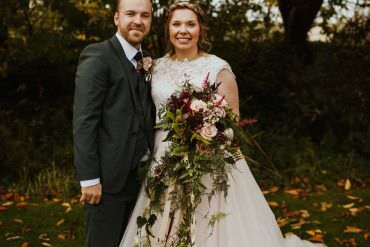 On the day she was amazing, blending subtly into the background, grabbing Rob & I for a few minutes at a time rather than long periods, and we absolutely love the photos which captured not only the beautiful venue and autumnal colours, but the absolute fun and happiness our guests had throughout the day. 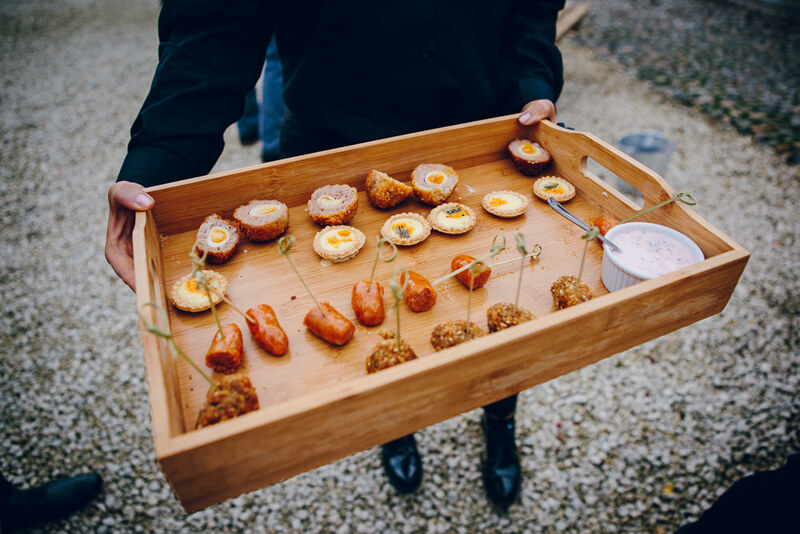 We used family friends Damien & Ray as the caterers for the wedding; we briefed them on the Northern Knees Up theme and we worked together on incorporating some of our favourite food into a wedding feast, focusing on northern, artisan food suppliers. 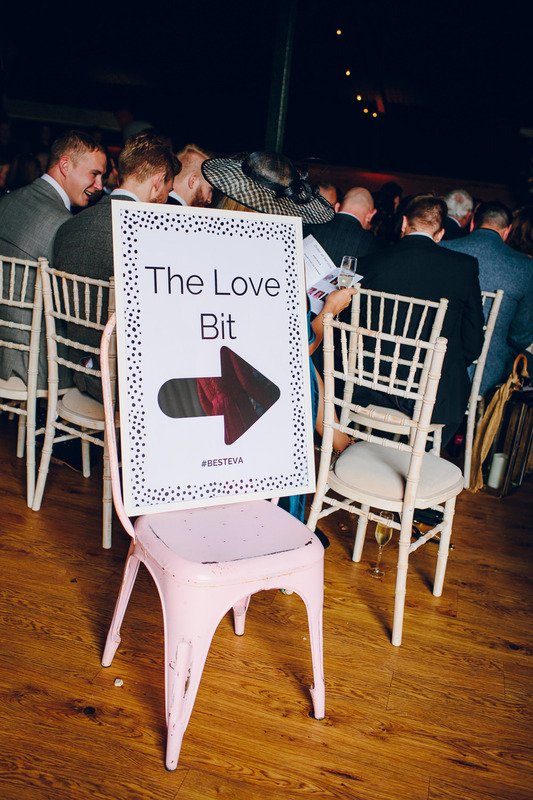 We wanted a sharing style service, so nominated a ‘Mum’ on every table (we had them a tabard printed especially!) and as Rob is a big Everton fan, nominated people we knew were big supporters of other teams as a funny talking point. We started with a northern sharing platter, which included cured meats, pickles and homemade bread. We then moved on to mains of pie, mash, mushy peas and gravy and sourced the pies from Great North Pie Co & Pieminister. To finish, we served mini dessert platters including pastel de nata & chocolate brownie. We had lots of comments on how good the food was! We ate quite late so in the evening we had a giant cheese board platter with Rob’s favourite pork pies (instead of a wedding cake) and jars of my mum’s famous home-made piccalilli. 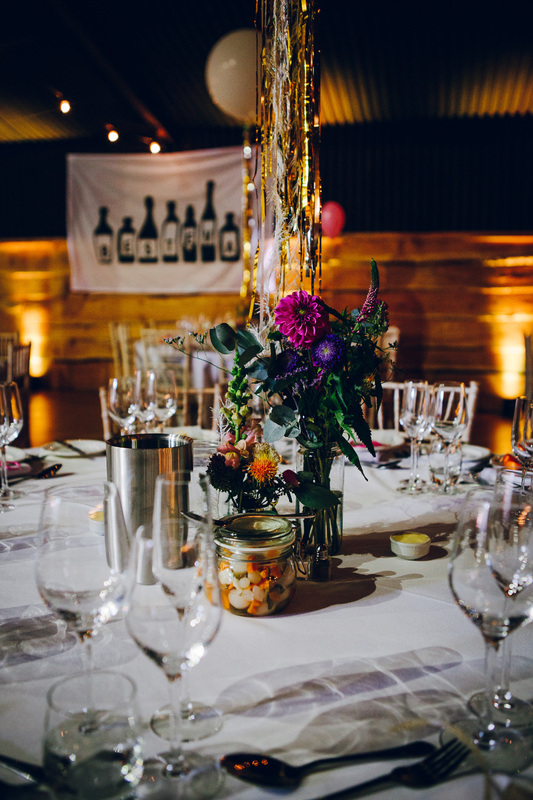 One wedding guest was busted at the end of the night stealing a full jar to take home! We have lots of Rugby League fans who were guests at the wedding (another northern trait) and the wedding date was the season finale. 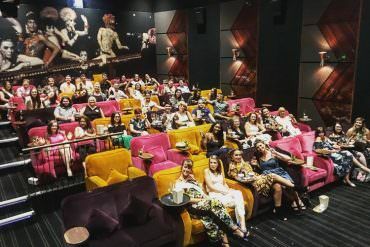 Whilst eating dinner, we had a giant screen showing the game – another ‘something different’ which our guests absolutely loved and added to the laid back vibe of the day. 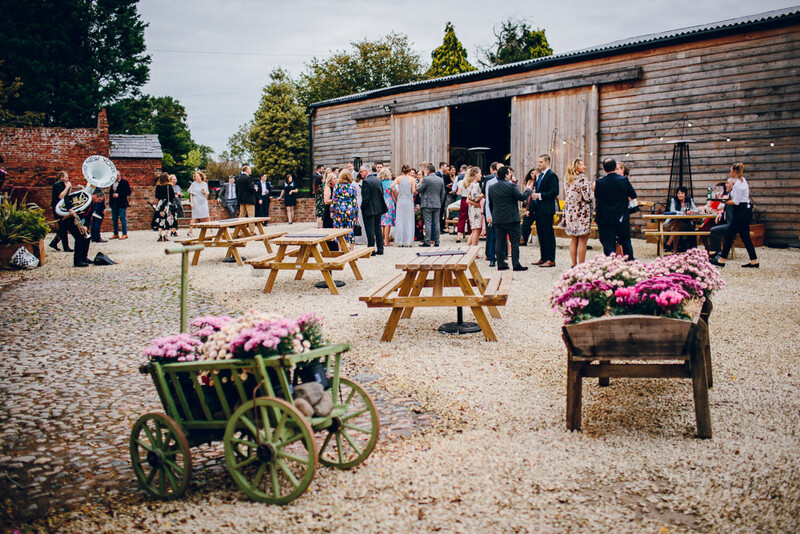 The venue was a complete blank canvas but the natural features of the barn were such that we didn’t need to over-dress. 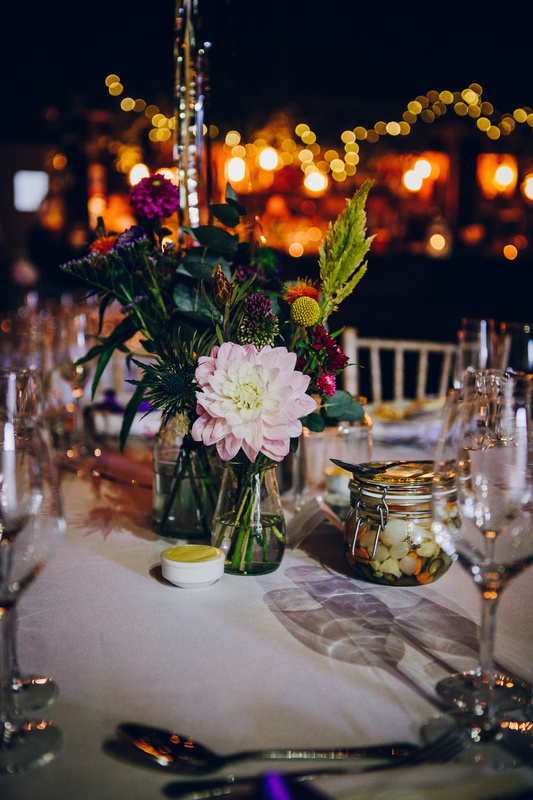 Due to the size of the room, anything we did do needed to have impact so we chose décor carefully to maximise any impact it could have. Zara & I worked together over a few months to create the look we wanted – she took my brief and created mood boards which pulled everything together into one look. She then helped source everything and keep costs to a minimum wherever possible. 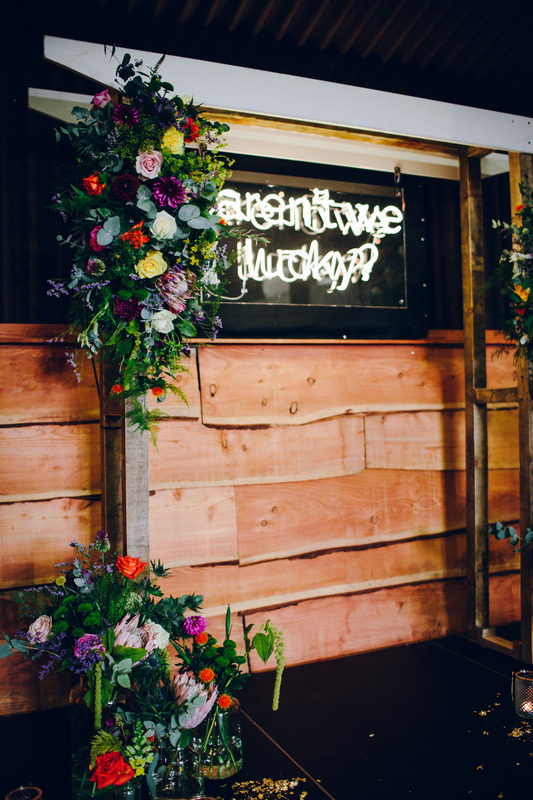 We created an altar focal point by designing a bespoke neon light which says ‘Aren’t We Lucky?’ a well-used family saying. This was hung on a stand made by my very talented dad which we then dressed with flowers. The sign now hangs proudly in our living room. 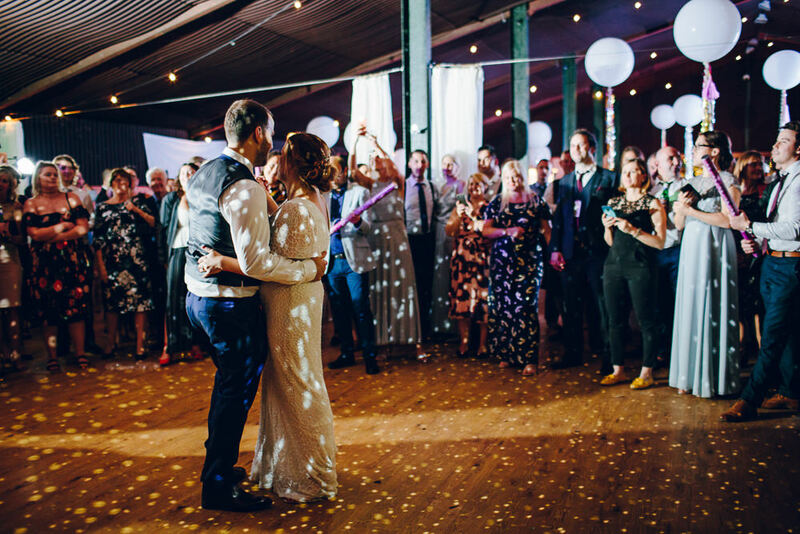 We used Hipswing who were recommended by the venue as AV suppliers – they supplied DJ equipment, staging, lighting, a giant disco ball (essential) and the big screen for the rugby. Seamless and professional service from these guys made it worth the additional spend. 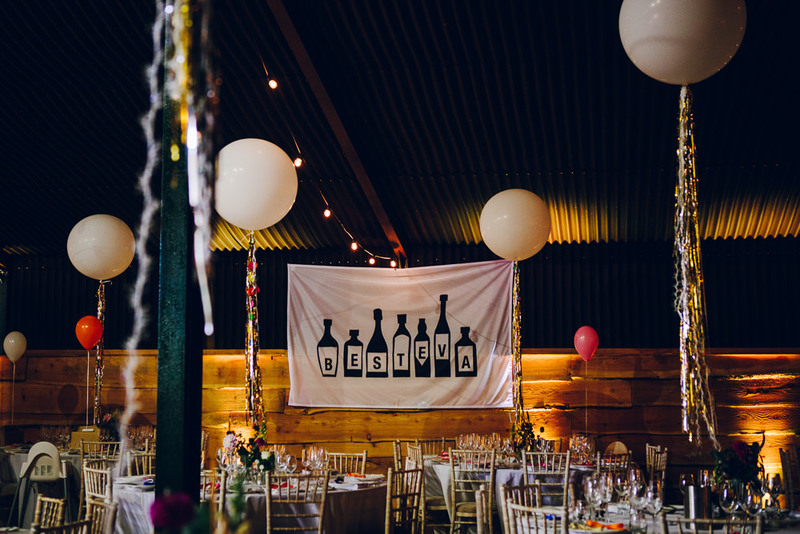 We used the steel girder feature of the barn’s walls to hang large banners which were designed by Rob’s relation Emma Collier who’s a talented art student; she used Northern sayings we liked and complemented with graphics which had a meaning behind them (one included an Iris flower). We then had these printed by a football flag company! They looked great on the photos. 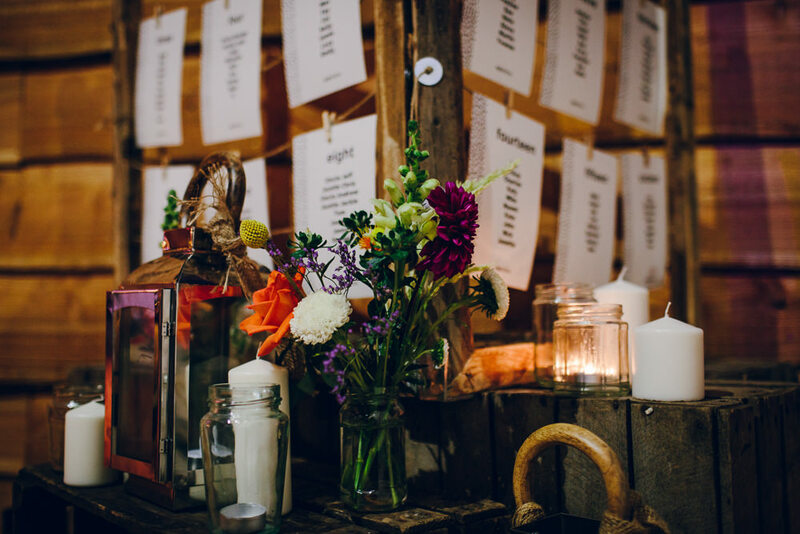 Props were quite important to house things like the table plan and cards; my uncle’s house is a treasure trove of props he’s collected over the years so we were lucky to borrow old suitcases, lanterns, apple boxes and other curious items from him. 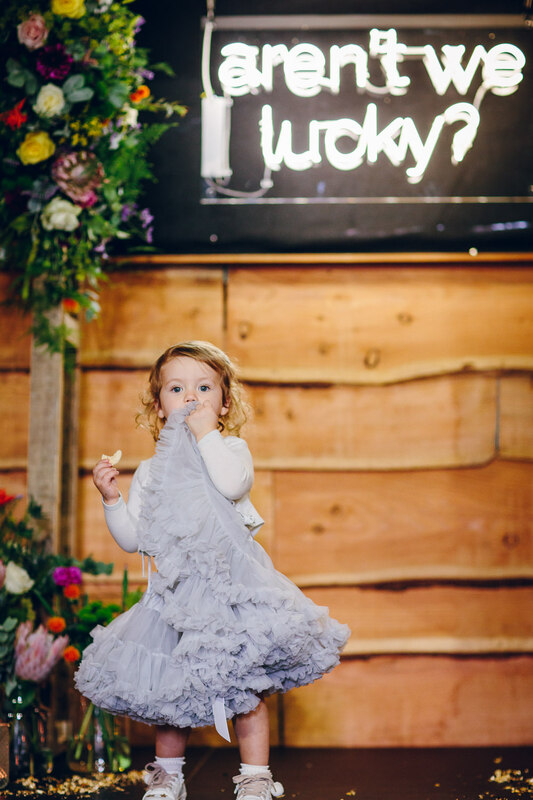 We hired some additional props to dress the venue, including a wooden market stall, from an amazing place in Manchester called Stockyard North which is props heaven – mostly used for TV and film but they also cater for weddings. We added the final props touches with cushions, frames etc. from Ikea. 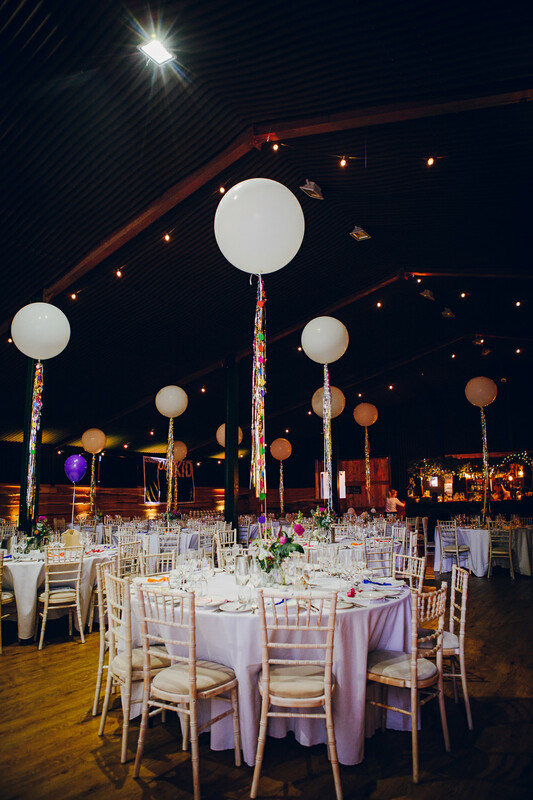 As the food was sharing platters, we couldn’t crowd the tables with decorations so had a few jam jars of flowers on each table, and used giant balloons to give some height and double up as table numbers. 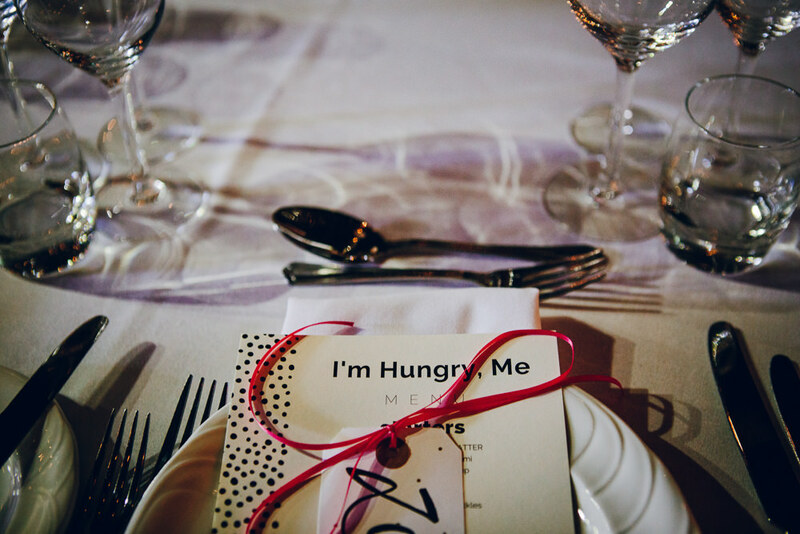 As part of the styling, Zara hand calligraphed all the wedding invite envelopes, and name tags for the tables which we used some coloured ribbon to tie in with the flowers. We ordered simple, one page invites from Papier, we then used a wedding website created for us by a friend to relay most of the information. 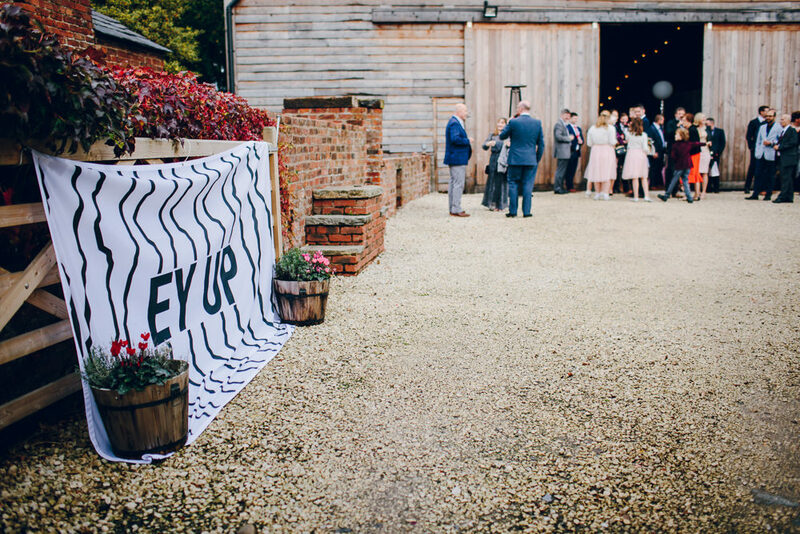 I created the rest of the wedding stationery myself (signage, order of service, table plan, thankyou cards) in Canva and used a local printer – who was brilliant and turned things around super quickly. This saved a lot of money and allowed us to make changes as we went. The morning after the wedding, we hosted a brunch in the farmhouse where the caterers provided hangover friendly food, and we invited everyone who had stayed in the area to come along to. It was great to hear the stories from the night before, and be able to chat to people more informally, especially those who had travelled a long way to be at the wedding. 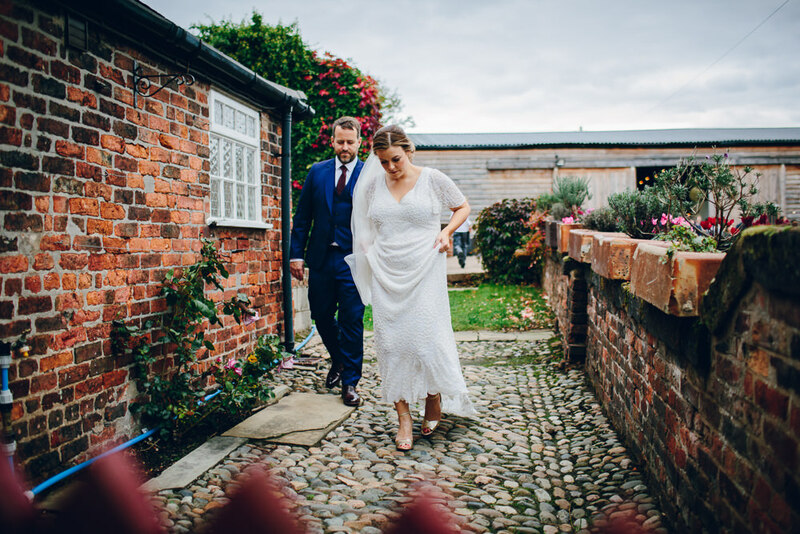 We stayed the night after the wedding in the farmhouse, just the two of us which was a lovely relaxing thing to do after the madness beforehand. We had a mini moon in Vienna in December but any plans for a honeymoon are on hold for the foreseeable as we concentrate on baby number two which is due in April! 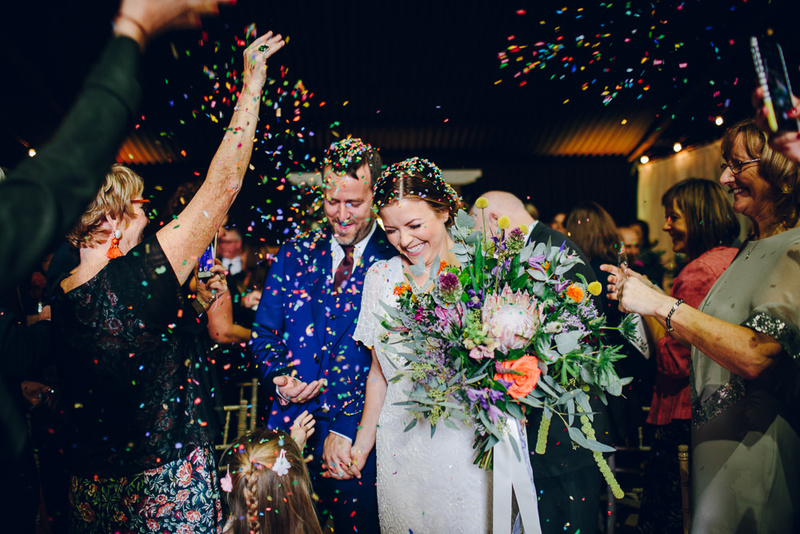 The ceremony was surprisingly our favourite part of the day; and a lot of our guests commented that it was the best wedding ceremony they’d ever been to (due in part to the fact we had drinks flowing throughout!) I was nervous about how it would play out considering it was literally all in our heads, but it worked perfectly, and even the parts that didn’t work just added to the vibe. Max, our usher, was supposed to have the rings to exchange but I’d forgotten to give them to him beforehand, so we ended up having to ask the crowd who had rings we could borrow! It was a really funny moment. 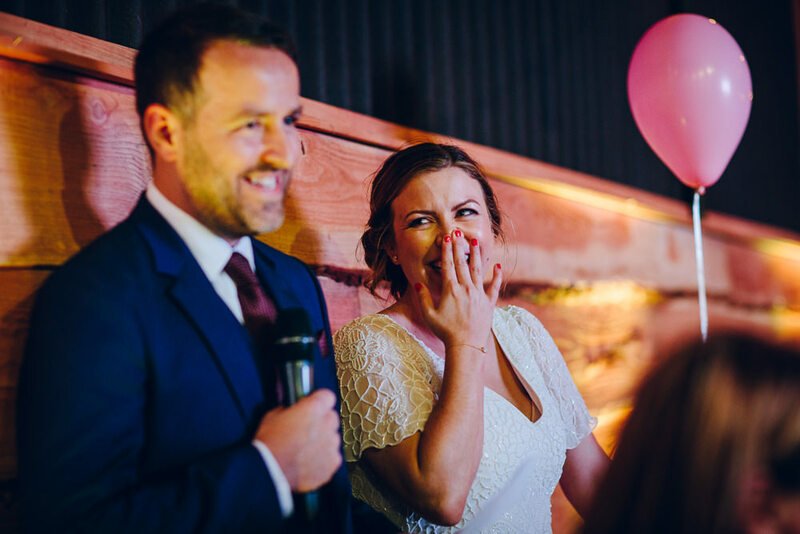 The speeches were also amazing – we did a joint speech, two of the bridesmaids told some embarrassing stories about me, and Rob’s best man Loz delivered a cracker. I’d certainly advocate for the girls to be as involved as the guys when it comes to speeches these days! 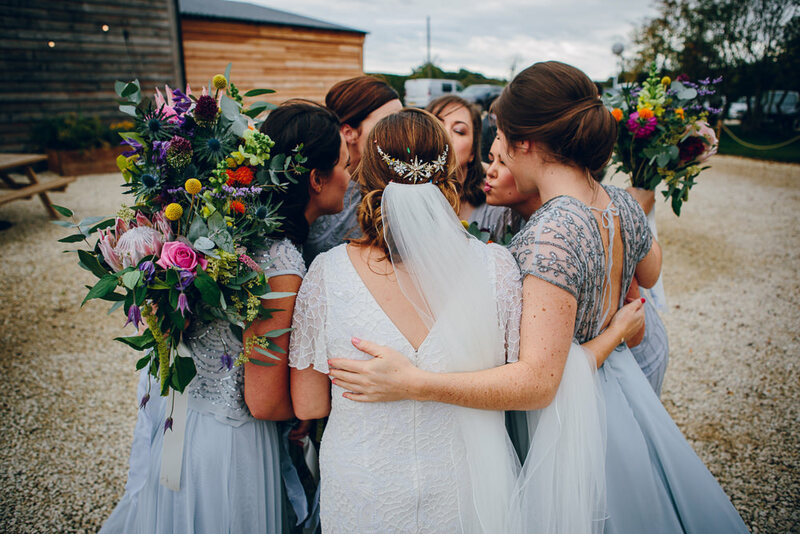 Spend money on things you value rather than what you think you should have at a wedding; who says you need to have a wedding car or cake if that’s not what you want?! Make sure the budget goes where you want to spend it. Don’t stick to the rules. 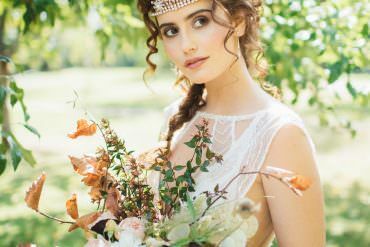 It’s the quirks which make your wedding unique to you. Don’t worry about small details too much – it will all come together in the end. 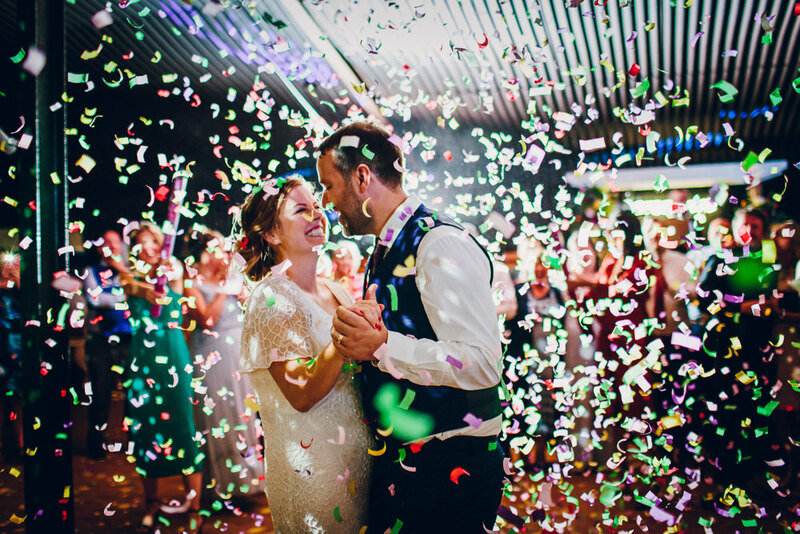 And even if it doesn’t (like forgetting the wedding rings) it will no doubt add to the fun! 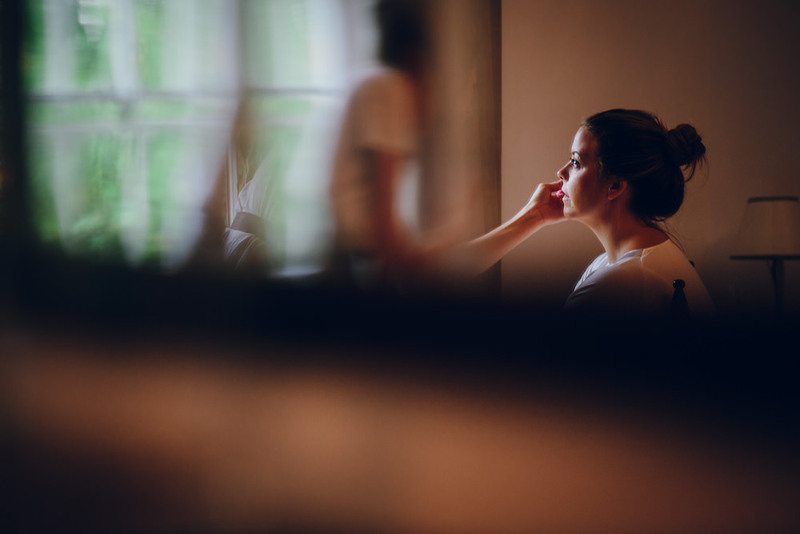 If you can, enlist the help of a wedding planner / stylist. 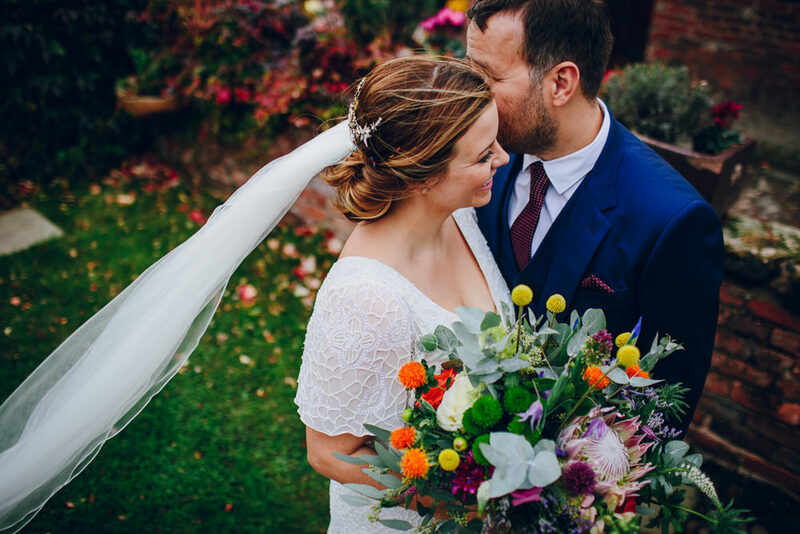 Having someone to lean on for advice, help & on the day support was totally worth it for us. Absolutely amazing to have been a part of this awesome wedding day. Kendra and Rob were quite the naturals in front of the camera! They made me feel very much a part of their wedding day. Beautiful photos, looks a stunning day. Love the fun and natural style of the photos.